become a very filling main course. This recipe could also be called “soy three ways” I suppose. It’s interesting that one ingredient (soy beans) can be turned into so many different products with so different tastes. What are the three in this recipe? 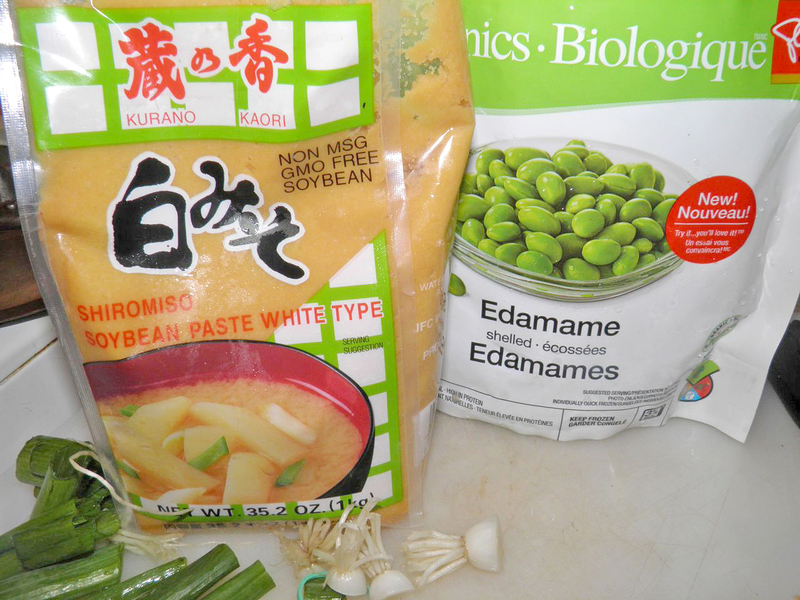 Edamame (fresh soy beans), tofu (ground soy beans) and miso (a paste made from fermented soy beans). The list doesn’t even include the most famous soy bean product – soy sauce. Left: miso paste; right: fresh frozen edamame. Tasty. Soy 1: Edamame, if you’ve never had them, are another name for soybean pods. They’re kind of like a cross between peas and lima beans. Edamame is also the common name for just the “beans” inside the pods. You can purchase them frozen in both bean and pod form in our local groceries. They’re very good and make an excellent side vegetable for any dinner. It’s not like they taste “Japanese”… But they are a little on the expensive side as far as veggies go, but worth a try. Soy 2: Tofu is also called bean curd. It’s made from coagulated soy “milk” and then pressed. The amount of pressure yields varying firmness, from soft through to extra firm. May people say tofu has no taste. This has benefits, as it can be used in both savoury as well as sweet dishes. It also takes flavour quite well. I have a recipe for marinated tofu “steaks” for a vegetarian barbecue. Essentially studded with garlic and marinated in soy and sherry, if memory serves me correctly. It is accompanied with a lovely sauce that has miso as an ingredient. Miso comes in various colours as well as tastes. 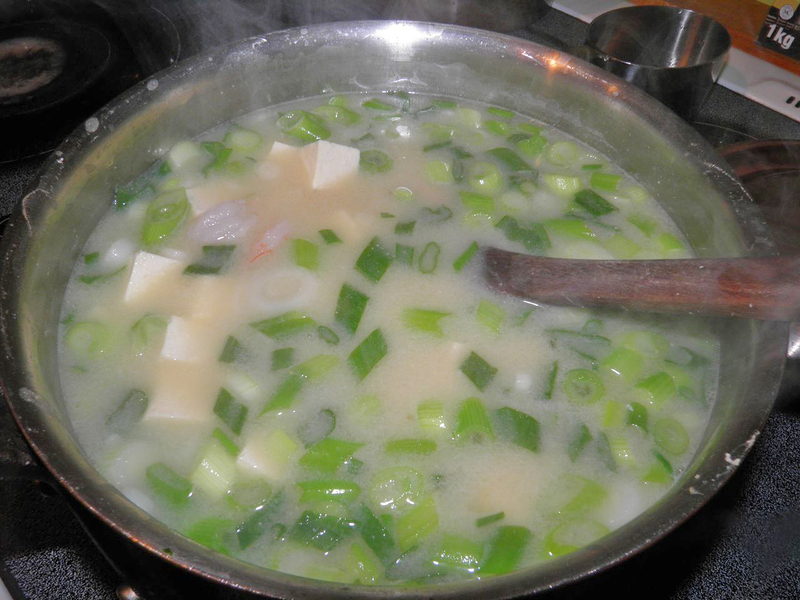 Miso soup usually uses "white" miso. Soy 3: And finally miso, probably the least used in the home kitchen of the three soys in this soup. Miso is called a “seasoning” but is actually a flavouring paste, if you ask me. (Seasoning is herbs, salt, pepper, etc…). 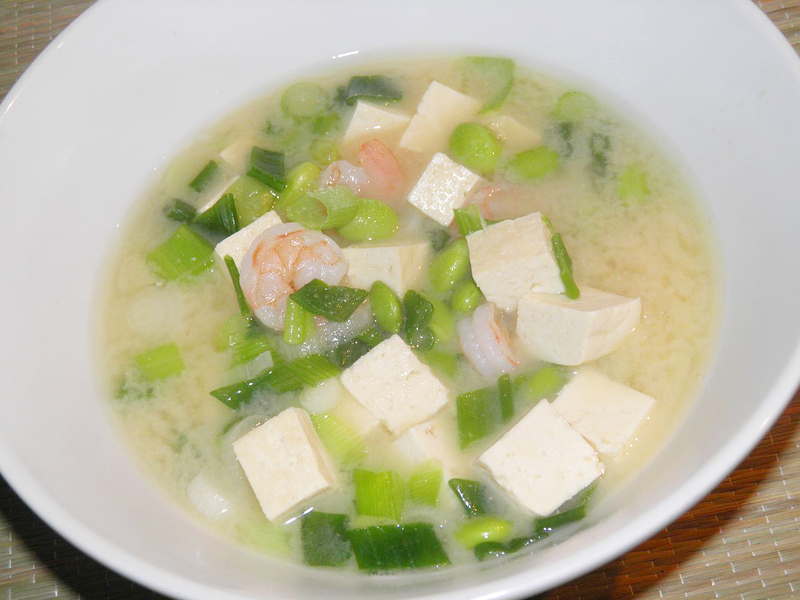 Miso is made by fermenting rice, soybeans, barley and other foodstuffs. 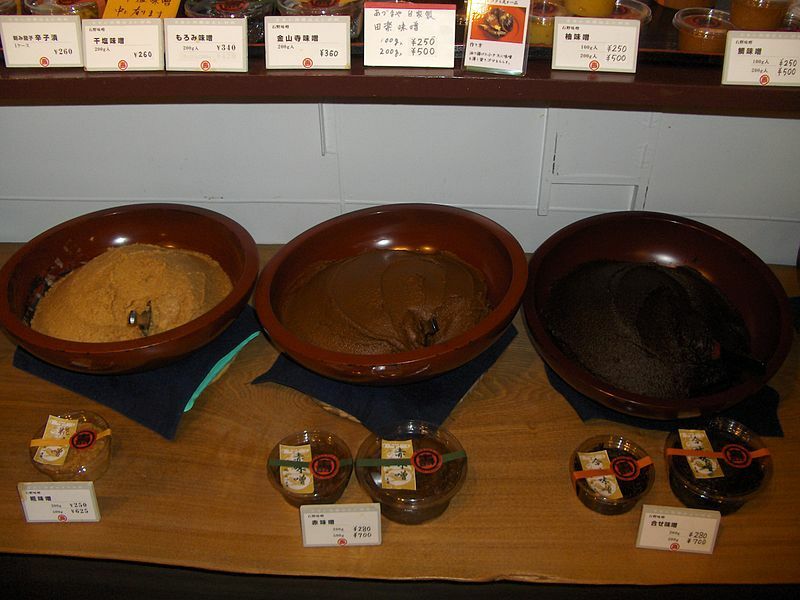 The resultng paste is used for sauces, spreads and as the flavour base for miso soup, whih nearly everyone has had at some point. The flavour of miso can vary widely, depending on what is used in its production. Miso can be salty, sweet, earthy, fruity or savoury tasting. This recipe will serve 4 as a main soup, or 8 as an opening course to a Japanese themed dinner. Miso soup is a fast recipe to throw together. Bring the water to a simmer in a soup pot. Add the miso and stir until dissolved. Then add the edamame and tofu and let simmer for 5 minutes. Add the shrimp and green onions and let cook until the shrimp are pink, about 3-4 minutes. Taste for salt and adjust if required.